Time for another piece on books at The Story Bazaar. Some of this reading is my research (that authorial quagmire) or at least that’s my excuse. 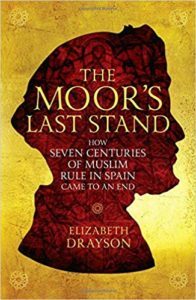 The Moor’s Last Stand; How Centuries of Muslim Rule in Spain Came to an End by Elizabeth Drayson (Profile, 2018) is an extremely readable account of the surrender of Granada to the Catholic monarchs Ferdinand and Isabella and the events, over generations, which lead up to that capitulation. The story begins at the end, on 2nd January 1492, the moment captured so well in the 1882 painting by Franciso Pradilla y Ortiz, La rendicion de Granada of the symbolic handing over of the keys to the Alhambra, though, as Drayson later point out, in fact the Alhambra was already under Christian control. 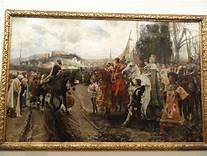 Incidentally, a version of Padilla y Ortiz’ masterpiece hangs in the gallery attached to Bodegas Tradicion in Jerez de la Frontera ( see Jerez in the Rain ). The Cambridge Fellow begins with the founding of the Nasrid dynasty by Muhammed I and progresses through the blood-thirsty family feuds and the flaws and fault lines inherent in the Granadan Arab state thereafter, until Muhammed XI, otherwise known as Boabdil, the last Moorish Emir. It is one of Drayson’s stated aims to ‘rescue Boabdil’s reputation’ which I think she achieves, at least in so far as the reader begins to see beyond the historical propaganda as well as the later romanticising and appreciate him within his own, admittedly epoch-making, historical context. Of course, he is the stuff of legend and of art, so this is no mean feat on Drayson’s part. She also gives space to Boabdil as fiction and legend as well as history, throwing up some unusual connections. The adoption of Boabdil as symbol of the collapse of the old American South surprised me (especially given some southern attitudes to race) I must admit. Washington Irving too wanted to rescue Boabdil. In his case it was from his detractors and, most particularly, the 1595 work by Perez de Hita Guerras civiles de Granada which casts Boabdil as the vicious, violent, weak and cowardly Rey Chico or Boy King. In Tales of the Alhambra, Irving claims he has read all the contemporaneous and later chronicles and finds that Boabdil’s name was ‘most foully and unjustly slandered’. The short stories are still entrancing today, though typical of the time in their prose style and in appealing to early nineteenth century Romantic sensibilities. Irving stayed in the Alhambra Palace itself while writing them and is clearly inspired by his, exquisitely beautiful, surroundings. There are stories, based in fact, about the palace itself, as well as some of the myths surrounding it, including of Boabdil. 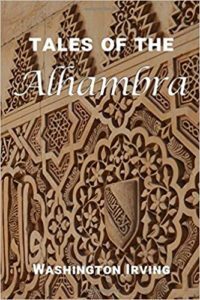 A visitor to the Alhambra today could do worse than read this collection and it is an interesting addition to The Moor’s Last Stand. I have enjoyed reading it again. What’s next on the research list? That would be Imperial Spain, 1469-1716 (Penguin, 2002) by Sir John Elliot, former Regius Professor of Modern History at Oxford. A much more traditional history book and one I’ve dipped into before, it’s very readable, but not perhaps, as much as is The Moor’s Last Stand. This entry was posted in Book Reviews, Books and tagged Book reviews, Books by juliej. Bookmark the permalink.